Hi there! She's back! My mom is back for another how to tutorial. In case you missed it, click here for tips on how to decorate your mantel and click here on how to create beautiful tablescape. 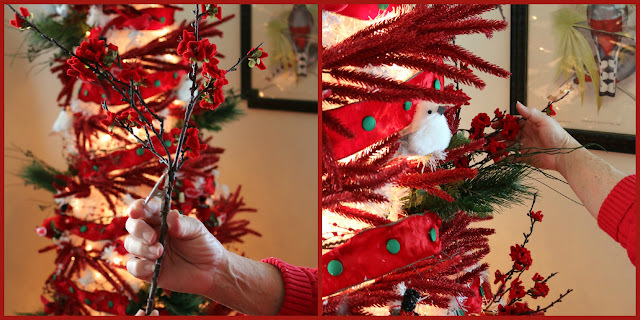 Today we're (and by we're I really mean my mom) going to show you how to decorate your Christmas Tree! You know how you go to a fancy hotel or read through magazine and you see these gorgeous trees and think, I want that in my house. Well my mom is here to tell you how to do just that! Take it away mom! 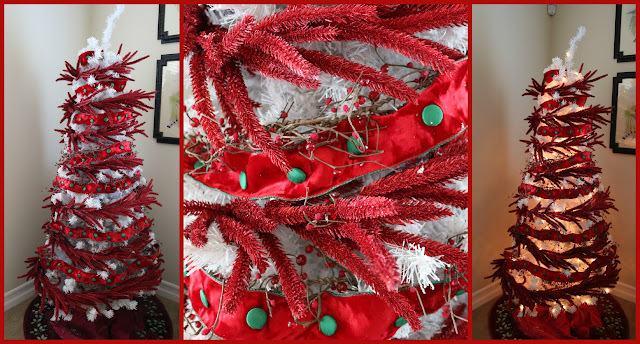 Soooo, I'm starting with my pre-lite tree with a tree skirt on it. First I do garland, starting from the bottom. I got this red feathery garland at Home Goods this year and I love it. Easy to work with. As I add each length I'm watching for even spacing around the tree. Then I add another row of garland. Be sure that the second garland is of a completely different consistency from the first. My first garland is long and feathery, my second is airy, small berries. It's all about creating interest. Different shapes and textures. I could have stopped here but I had this button ribbon from last year and just wanted to enjoy it again. As I add the ribbon I used the berry garland to keep the ribbon in place. Just twist as needed. Now for the top. I am using picks of berries and poinsettias and holly. Up the ladder, back down the ladder, again and again. Checking the look and the balance~ how far up, how far out and how close to each other do I want it? Totally subjective. I add picks throughout the tree. I used greenery with small pinecones here and red flower branches. Always checking for a balanced arrangement. Now I add ornaments. Birds are the theme here. White and red ones. Some I just push in, some are on metal 'feet' and some I just push on to the tip of a branch, in through the hole at the top of the ornament. 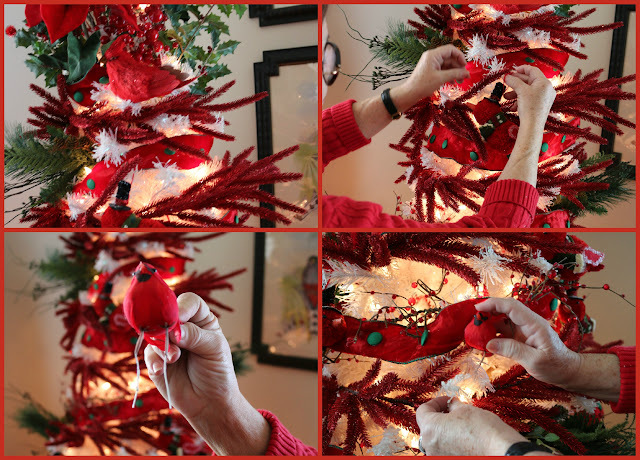 TIP: A spool of wire is great to have to put your ornaments on your tree. 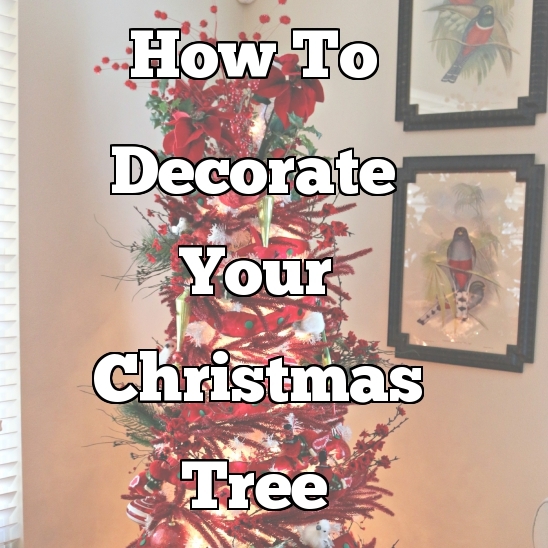 You'll get much better placement with it rather than trying to use those little pesky ornament hangers. Cut the wire to the length you'll need, feed wire through the loop on the top of your ornament half way. 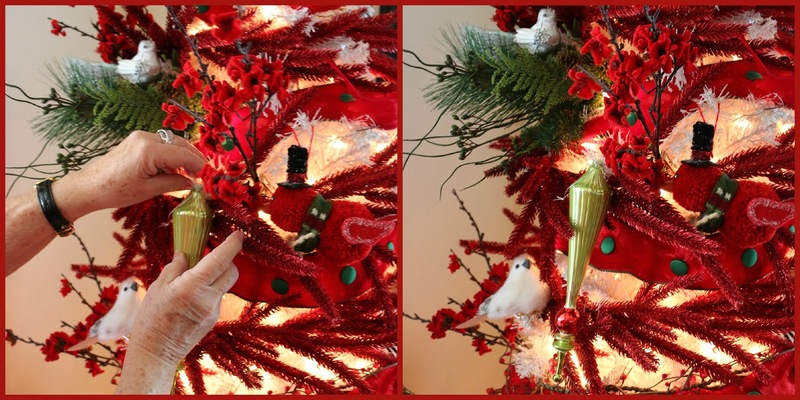 Now you can attach the ornament to the tree at any length drop you want, twist wire as needed around the branch. 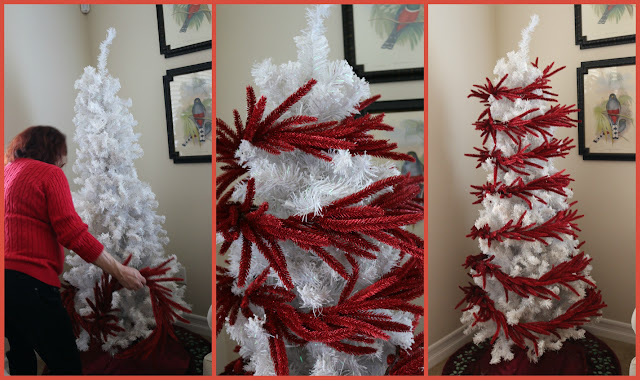 Have fun with your Christmas tree decorating this year! When my children were young I'd let them put on the ornaments. I did not adjust them because they knew where they'd put them and I didn't want any hurt feelings. Now I just please myself. No, my husband has absolutely no say whatsoever! Unless, of course, he wants to do all the work! That'll be the day! I got married at Christmas time 45 years ago. I still have some ornaments and a cute pair of Kissing Angels we bought in Carmel on our honeymoon. I love decorating for Christmas! The whole house gets the treatment. But over the years my tastes have changed and I now have décor of a widely diverse nature. Traditional Christmas, Sparkly Christmas, Silver Christmas, etc. It would be more fiscally responsible to have chosen one theme from the beginning and added to it as the years went by. But I suppose Christmas is about heart, not fiscal responsibility. And, as a decorator, I've just had to express myself all these years. Right? But maybe I could have done both~ decorate and be fiscally responsible. Maybe. Now head on over to Sarah's Blog to see some of the other decorations I did around the house. Including a whole tree dedicated to Notre Dame football..